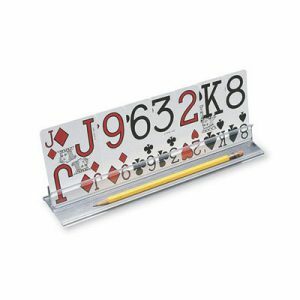 Cards of any size fit into the 25 cm slotted playing card holder that keeps them at an easy viewing angle. The bottom of the cards can be seen through the plastic and an extended bottom ledge holds pencils, coins or chips. People with pain and/or limited use of their hands will find using this holder much easier than trying to hold multiple cards in one hand. Can be used with playing cards, mah-jong tiles, matching/sequencing cards, recipe cards etc. Clean with household detergent and warm water.